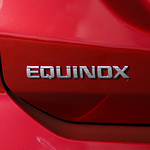 The Chevy Equinox has a variety of safety features that help you achieve peace of mind whenever you drive in Council Bluffs or anywhere else. For example, the car will apply the brakes for you when it senses a frontal collision about to take place. While it may not avoid an accident entirely, it can help reduce the severity. In some cases, it may sense the object before you can see it and react accordingly. It will also look for objects such as bikes or vehicles ahead of you to help adjust your speed even if an accident is not imminent. This can help to reduce the wear and tear on your vehicle's brakes and improve gas mileage. Driving at a lower speed is also safer in general because you will have more time to react to a pedestrian or other object that gets in your way unexpectedly.